This Student accommodation is located in cork city centre. 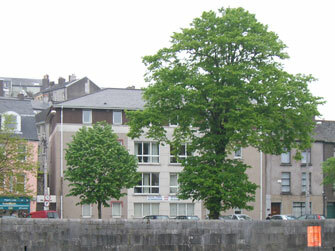 All cork city colleges are accessable from this complex. CIT faculties such as music and art are located minutes from the complex with the main CIT campus is within quick commuting distance. CIT main campus is serviced directly by the nearby number 8 bus. These apartments are set on the Quays of the River Lee, with each apartment offering a large bay window providing lots of light and views of the river Lee and the city. It is located in close proximity to the many transport facilities the city offers, only minutes from each station i.e. the train station, the bus depoit along with the airport links passing every 30 minutes and an onstreet taxi depoit and cab office. All apartments are four bedroom with a mix of double and single bedrooms and there are two bathrooms per apartment.